Big Basin Redwoods State Park is the oldest state park in California. It was acquired in 1902. 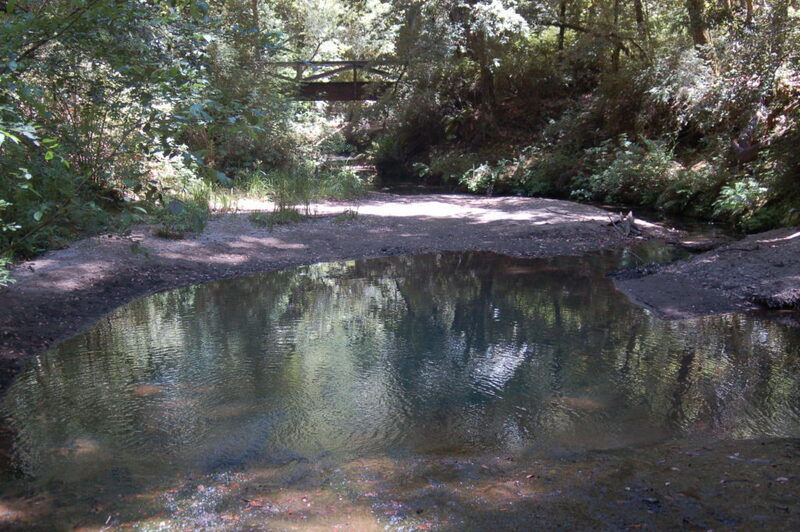 The park has miles of trails, which serve hikers and equestrians, link Big Basin to Castle Rock State Park and the eastern reaches of the Santa Cruz range. The Skyline to the Sea Trail threads its way through the park along Waddell Creek to the beach and adjacent Theodore J. Hoover Natural Preserve, a freshwater marsh. The park has a surprising number of waterfalls, a wide variety of environments (from lush canyon bottoms to sparse chaparral-covered slopes, many animals (deer, raccoons, bobcat) and lots of bird life (including Steller’s jays, egrets, herons and acorn woodpeckers.) The park is also home to stately redwood groves. Take Highway 17 to Mount Hermon Road. Turn right on Graham Hill Road, go one block to light, turn right onto Highway 9, follow the highway to Boulder Creek. At the Highway 236 intersection, turn left. Follow 236 approximately 10 miles to park gate. By Bus: Take Santa Cruz METRO 35A to Glen Arbor-Big Basin. Exit at Big Basin Way & Big Basin State Park. Walk 279 feet and you will arrive at the destination: 21600 Big Basin Way, Boulder Creek CA 95006. Big Basin has 80 miles of trails and roads. Guided hikes are scheduled. 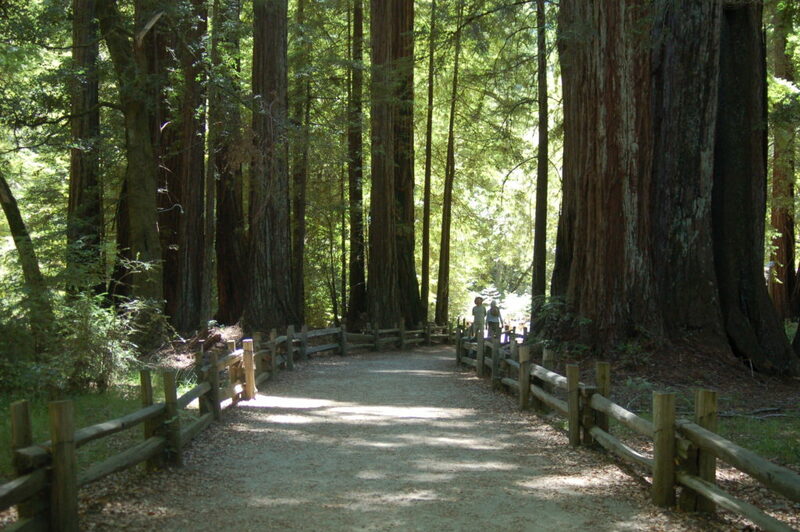 The Redwood Loop Trail is wheelchair- and stroller-accessible. The 33-mile Skyline to the Sea Trail runs from Castle Rock State Park through Big Basin to Waddell Beach at Rancho Del Oso. Activities are offered year round. Check the calendar for times and topics. A variety of camping options are available at the park. The parks Nature Lodge has exhibits and historical park photographs. See wonderful photographs of the area from years past, learn about redwood forests, and see the many birds, reptiles, insects and mammals that live in Big Basin. The Visitor Center is open 9 a.m. to 5 p.m. daily. 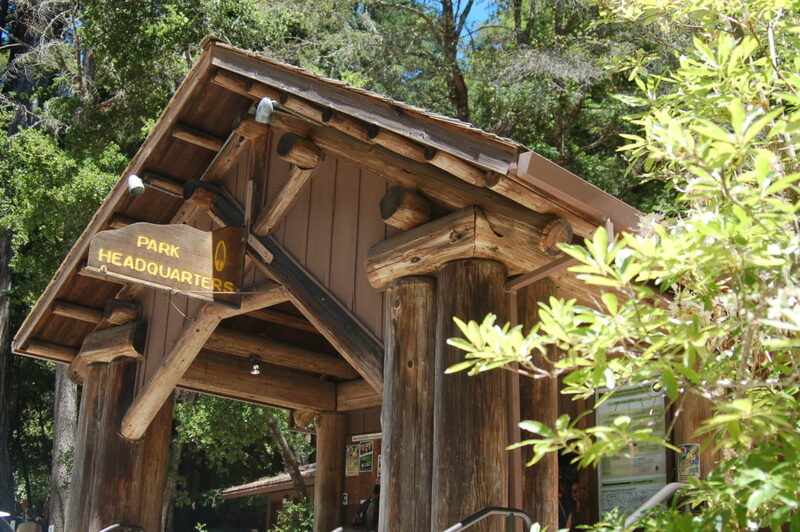 Big Basin Redwoods Store, located across the street from Park Headquarters, is open February to December and carries supplies for park visitors. Hours vary seasonally in the spring and fall, and it’s open 8 a.m. to 8 p.m. in the summer. There is a gift shop next door with a wide selection of gifts, postcards, clothing and more. There are ADA-compliant trails at the park — learn more in the Hilltromper Wheelchair-Friendly Trails Guide. There are 146 family campsites, four group camping sites, tent cabins, trail backpacking camps and horse camping are available at the park. Each drive-in campsite includes parking fee for one vehicle. Maximum trailer length is 24 feet, and 27 feet for campers and motorhomes. For complete camping options and reservations, go online or call (800) 444-7275. Trail camps are open by reservation only; for trail camp information, call (831) 338-8861. The Backcounty Trail Camp office hours are 9 a.m. to 5 p.m. Monday through Friday. Water is available only at Castle Rock, Waterman Gap and Jay Camp. All other camps have no potable water provided. Go online to learn more about trail camps. For horse camping at Rancho del Oso, call (831) 425-1218. View the Campground Rules and Information Map here. All group tours and guided walks must be arranged at least 15 days in advance by emailing susan.blake@nullparks.ca.gov or calling 831-338-8883. Reservations are made by phone only. Please give 24 hours notice for cancellations. A ratio of one adult to every seven children for all guided walks at Big Basin is requested. The maximum group size for all guided walks is 35, which includes both children and adults. To make a field trip more engaging, large groups are often broken into smaller groups of students and adults. A team of dedicated volunteers rove the trails, interact with visitors, host at the Visitor Center and in general contribute to the inspiration, education and enjoyment of park visitors. 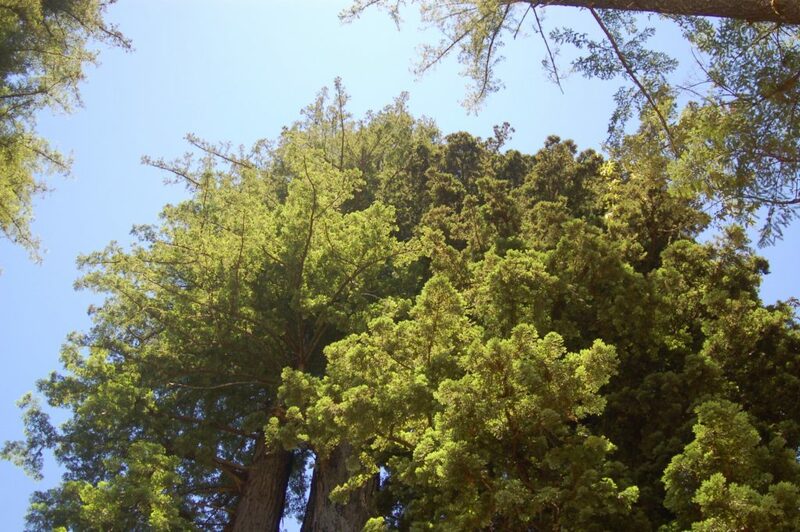 Docents: Learn about the magnificent old-growth redwoods and Big Basin’s wonderful cultural history, then share the knowledge with the public. Call (831) 338-8883 for more information or a volunteer application. Camp Hosts: Help visitors while living in the park. For information visit the Campground and Park Hosts page. Wilderness Patrol: Hike or mountain bike into scenic backcountry along the famous Skyline to the Sea Trail. For more information, contact the program coordinator Jeremy Lin at (831) 427-2288 or email rdopis@nullparks.ca.gov. Trail Crew: Since 1969 the Big Basin Volunteer Trail Crew has helped make it possible for others to safely enjoy the beauty of the park. The Trail Crew meets the second Saturday of each month, rain or shine. A typical workday lasts until mid-afternoon. Please bring work gloves, lunch and water. The story begins in 1889 at Henry Cowell Redwoods State Park when painter/photographer Andrew P. Hill was hired to take pictures of redwoods in Welch’s Grove (now Henry Cowell Redwoods State Park). But Welch would not let him take pictures of his grove so Hill traveled to Big Basin area instead. He was so inspired by the grandeur of the redwoods, and so alarmed that all these giants were being cut down, that he vowed that the magnificent trees should be saved for generations to enjoy. Hill and friends, such as journalist Josephine McCracken, attracted wealthy and influential people who formed the Sempervirens Club. These visionaries raised funds and convinced legislators to purchase Big Basin. Thus began the preservation movement and in 1902 the establishment of California’s first State Park. Since that time, public and private partnerships have added to the park with its original 3,800 acres increasing over the years to more than 18,000 acres. Behind these efforts lie the passionate stories of visionaries, visitors and workers and the history of this preservation movement. Big Basin Redwoods SP, Big Basin Tent Cabins, Little Basin Redwoods SP and the Backpack Trail Camps are “Crumb Clean.” Visitors are required to watch this short video about the impact your food has on park wildlife. Dogs are allowed on leashes no longer than 6 feet. They are permitted only in campsites, picnic areas and the North Escape Road. No fishing is allowed in the park. Bikes are allowed only on paved and dirt roads, not trails. Horses are allowed only on trails marked with horseshoe symbol. All natural and cultural features in the park are protected by law and may not be disturbed or removed. Collecting is prohibited, including downed wood. Firewood may be purchased in the park. Feeding wildlife is prohibited by law. Reservations are required for trail camps. 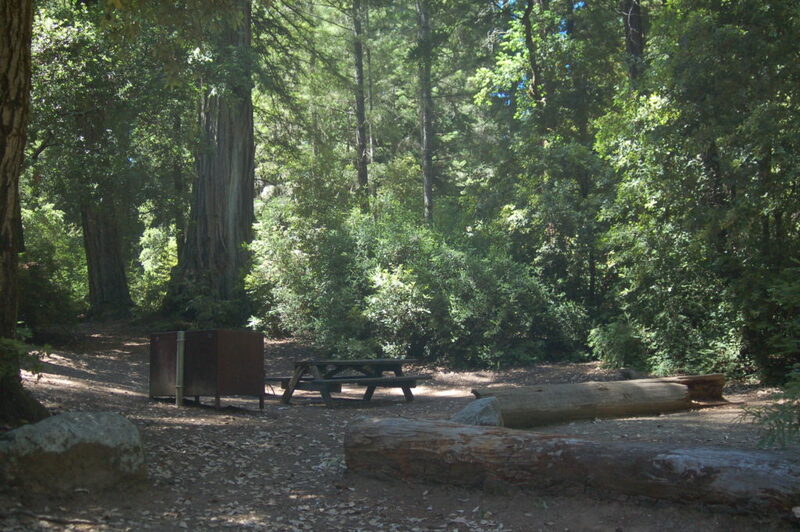 Fires are prohibited in the Backpack Trail Camps, except in Castle Rock Campground during the winter in the provided fire rings. Backpack stoves are permissible.